I can still remember how, before college, studying at the University of the Philippines was somewhat of a myth. My mom was teaching chemistry at De La Salle University-- another university close to my heart and my soon-to-be graduate school alma mater, if things go well--but mass media (movies like Moral and songs of the The Eraserheads) really sold me to the idea of going to UP. 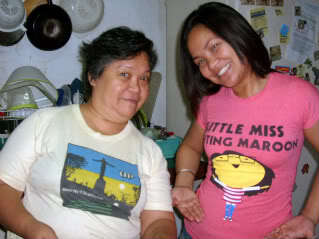 Five years in Diliman, however, can take its toll on a suburban girl like me. Manila is no picnic either, but it's just one comfortable bus ride away from my village, so I chose to go to DLSU for my MFA. But I've been missing UP lately. I think this a feeling that most alumni get every so often, and this is why they keep going back. I wasn't able to go to the Centennial celebrations, and I've backtracked on numerous plans to go there for whatever. It's high time I go back for a visit, I think--and the universe is giving me signs! To begin with, this article, written by Gilda Cordero Fernando, was published in today's paper: A gourmet’s guide to UP and other concerns. The best barbecue on campus, however, is found in Beach House beside the Main Library. Unfortunately they’re open only for lunch. But there’s Kha’s place in the arcade near the swimming pool. It serves Middle Eastern food. Their specialties are rice biryani and ox brain soup and they have lassi. Sadly, though, it doesn't mention this hole-in-the-wall Thai eatery I discovered through my orgmate Vincent Coscolluela. I suppose that one's long gone, because when my MFA classmates and I went there a couple of years ago, upon the insistence of Allan Popa, the place was nowhere to be found. 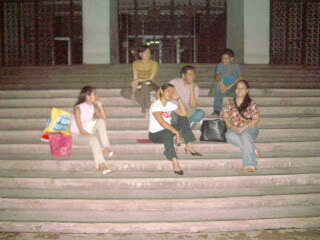 My DLSU friends and circa-DLSU-again me, posing at the AS Steps, a la Moral. It didn't seem cool to do it when I was actually a student! Besides, we didn't have digital cameras back then! Left to right: Candy Villanueva, Razel Estrella, Heizel Mainar, Jonathan Siason, Allan Popa, and me. I forgot I had my own, but wearing it would have been too contrived anyway.